Well known as a member of the mathematics faculty at Calvert Hall, Miceli began his teaching career teaching multiple subjects. He is known for his attention to detail and well-respected among his peers. Students remember him fondly for providing “opportunity periods” in which he provided math assistance before and after school. Miceli began coaching at Calvert Hall in August 1958 and started teaching at The Hall on November 10, 1960. He won a Maryland Scholastic Association (MSA) JV football title before being named the Varsity head coach. He coached the Varsity Cardinals from 1974 to 1987. During this time, he won 104 games and 6 Varsity MSA championships. Miceli was named the 1979 Baltimore Sun All-Metro Coach of the Year as well as Coach of the Year four times by the Quarterback Club of Baltimore. After leaving the Calvert Hall sideline, he spent nine years as the offensive line coach at the Johns Hopkins University. Miceli returned in 2000 to become an assistant football coach to head coaches Lou Eckerl, Jay Robinson ‘74, and Donald Davis ‘96. He served as the school’s athletic director for three years. Mostly commonly known for coaching football, he also coached Fresh/Soph basketball, JV basketball, Varsity basketball, and JV baseball. He won a MSA title in baseball. In 1992, he received the Calvert Hall Distinguished Lasallian Educator Award. This award honors educators who exemplify the ideals of St. John Baptist de La Salle, the Patron Saint of Teachers of Children and Youth. In 2002, he was honored by the Archdiocese of Baltimore for Teaching Excellence. This award recognizes individuals who have distinguished themselves as exemplary teachers and who are truly committed to Christian teaching. 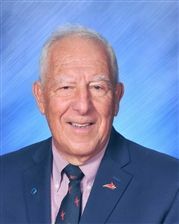 The De La Salle Christian Brothers and the Christian Brothers Community at Calvert Hall College formally acknowledged Augstine F. Miceli, Sr. as an affiliated member of the Institute of the Brothers of Christian Schools in 2015. This is the highest honor to be bestowed upon a lay colleague by the Christian Brothers and recognizes a lifelong and extraordinary commitment to the mission of the Brothers. His letter of affiliation was presented with the endorsement of the Brothers’ District of Eastern North America and the Superior General in Rome. Miceli will teach his last class on May 30, 2019.